If you’re interested in finding out what my novel „Summer of the Gods“ is about, you can now download a reading sample, consisting of the first three chapters as a PDF document. 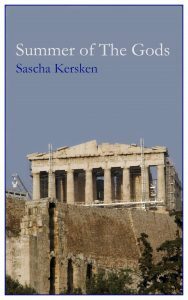 Autor SaschaKerskenVeröffentlicht am Januar 13, 2017 Kategorien Book, Ebook, English, Fantasy, Gods, Mythology, Politics, SocietySchreibe einen Kommentar zu „Summer of the Gods“ for free! Athens, in the summer of 2015. The negotiations concerning the economy crisis are going on as expected: European Commission, International Monetary Fund, and European Central Bank think as much that they’re right as the Greek participants are sure that these foreign powers don’t really want to help them. The heat is as stale as the debates. This general deadlock is suddenly disrupted by new players whom no one would have counted in: the Ancient Gods are back! But what do they even want? Are they really the selfless helpers they pretend to be? Are they even working together, or against each other? And what about people’s free will? The experiences of seven characters build the panorama of this story that takes a look at how an intervention by powerful and mysterious beings can change the world. A story about power and powerlessness, war und peace, trust and treason, humans and Gods, politics and the economy. * Some of the links used in this article are Amazon Affiliate links which means that I earn a small extra revenue if you use them to order the item(s). The price won’t change for you, though.